It’s the same one that shows up on your Facebook newsfeed — shared by your innocent, unknowing neighbor or that guy you went to high school with who’s now on a paleo kick. Now not only do you have to shudder at the sight of it as you scroll past, but you also have to see your dear friends showing their support by liking the post (or, as I see it, fallen victim to a fear-driven advertising ploy). Sigh. Here at Green Mountain at Fox Run, we believe that fear has no place in our relationship with food. We should feel freedom and joy when making choices about what to eat — not anxiety. But that’s hard to do in a culture that constantly teaches people, and especially women, that we can’t trust our bodies to do what they do best — stay alive. Luckily, we offer a retreat for that. You can come stay at our center in Vermont for a week or two (or three or four!) and learn all about nutrition, fitness, and life management in an environment where folks don’t believe that your weight dictates your worth (or your health, for that matter). But in the meantime, I figured, rather than continue to get all worked up about these food restriction lists, why not just have some fun with it? My hope is both personal and professional — that by writing this post, I can let go of the frustration I harbor when I see these ads, and you, the reader, can begin to see the ridiculousness in these advertisements. Besides, the next time you see someone post about how bread is evil or sugar is toxic, you can leave this tongue-in-cheek link in the comments — and really get a conversation started. You should not eat spoiled food. It’s just bad for you! Another very powerful tool, especially when inspecting things in opaque containers, like expired milk, is your taste buds. That was how we did it way back when, and that is likely why our taste buds are so advanced today. We would cruise across Mother Earth, stumble upon a food source and taste a teeny, tiny bit of it. Our taste buds would then discern risk versus benefit — pick and a choice would be made to either eat it or leave it for the vultures (fun fact: vultures actually have a much more avant-garde gut than we do — one that can handle rotten stuff no problem). 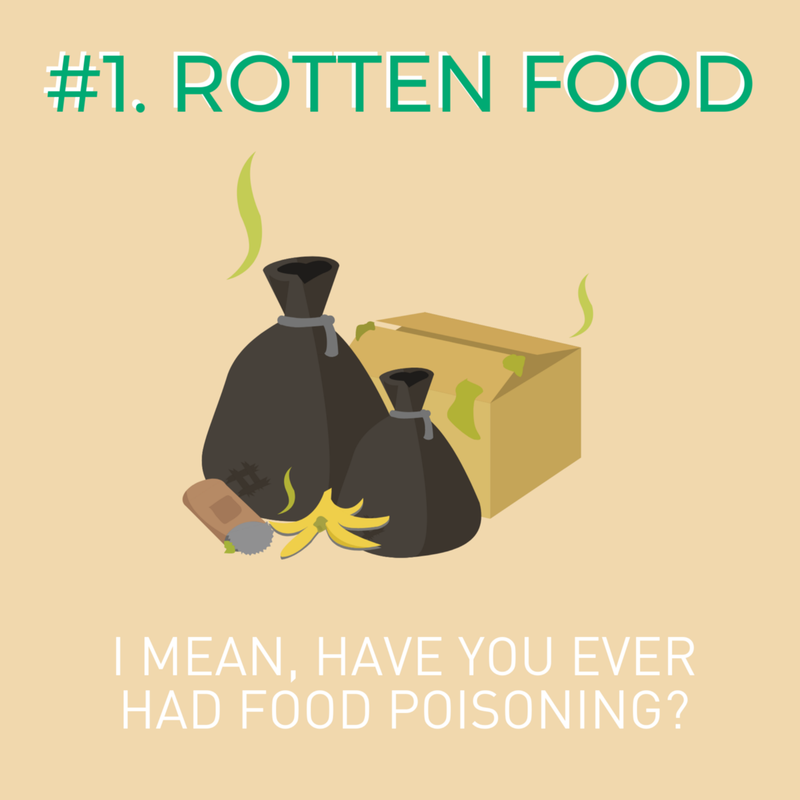 Rotten food, generally speaking, can cause you a lot of grief. Have you ever had food poisoning? Then you know what I’m talking about. Definitely do not eat anything poisonous! In fact, it could kill you! 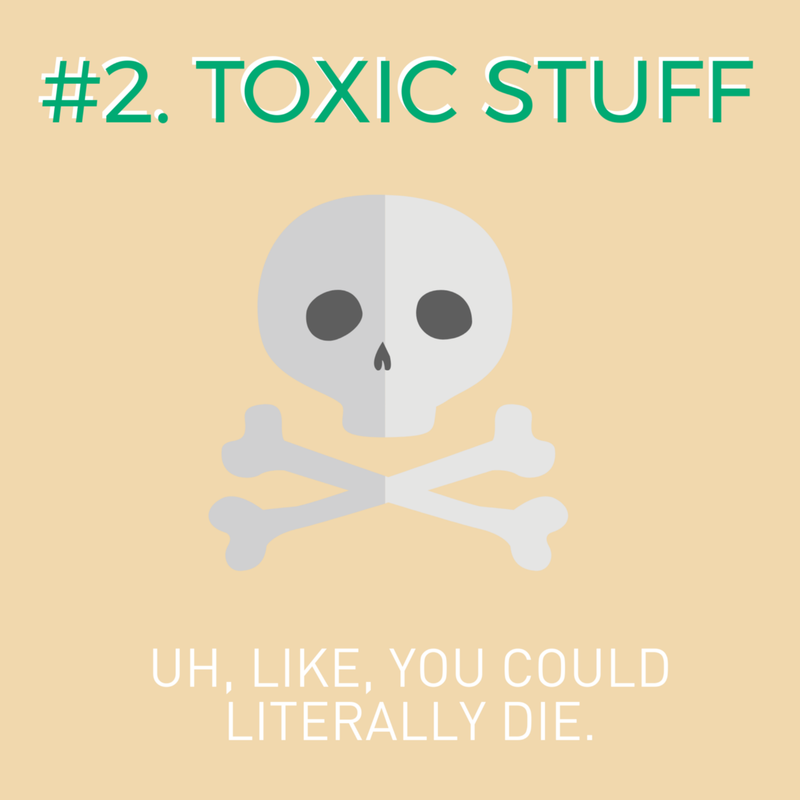 Thankfully, most household items that contain poisonous substances are marked with an intimidating skull and crossbones symbol — you know, like you see in cartoons. But again, that little useful tool, just like the expiration date, is a drop in the bucket as far as evolution goes. Again, thank you, taste buds! Because of those little buggers, we are not only surviving but thriving. Our taste receptors that detect bitter flavors evolved to help us identify toxicity in plants and more. And this important evolutionary adaptation occurred a long, long time ago — like, before the human migration out of Africa! That’s how important our bodies knew it was to detect poisonous food. In order to survive as a species, we had to develop a way to avoid these toxins — and fast! Fugu — If ever given the chance to try it, do! But it’s not likely you’ll even have the chance because only licensed chefs who are trained in thoroughly removing the poisonous parts are allowed to prepare the dish, and we don’t stumble upon those chefs every day. Poisonous food is bad news (uh, obviously). And while Poison Control is just a phone call away, it probably makes more sense to just avoid the stuff. If you’ve gotten to the point where the food isn’t expired and it doesn’t contain a poison warning, good. Give it a go. But if you start eating it and it’s not enjoyable, then stop eating it. Plain and simple. Here’s an example: Maybe you go out and get yourself some perfectly good kale and use it in place of your typical go-to, romaine lettuce. 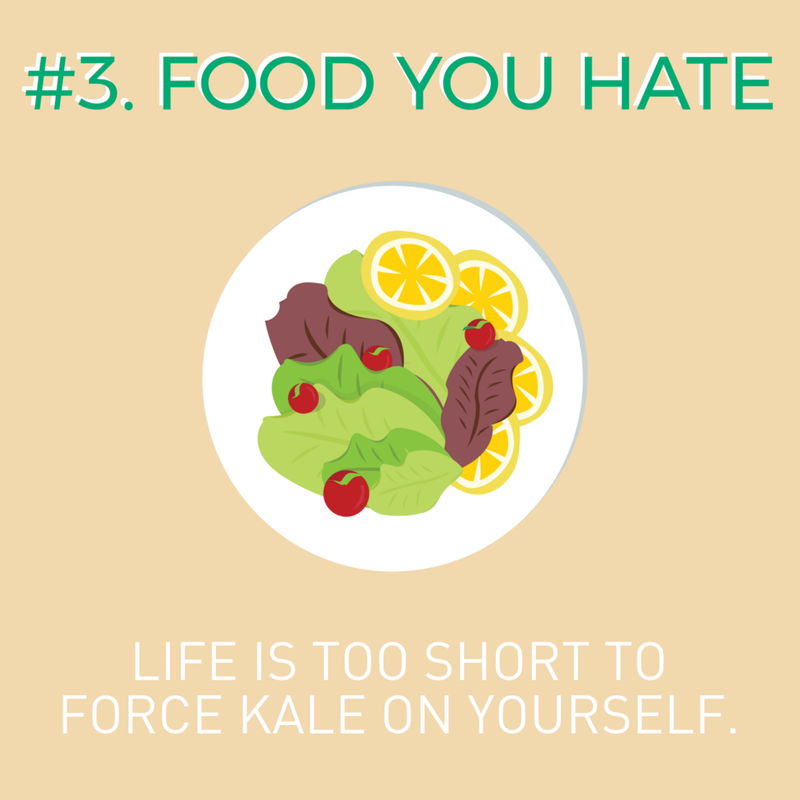 Maybe you did this because someone told you that kale is a “super-food,” and you’ve heard so much about it that you want to see about adding it to your routine. But alas, once you try your first bite, you quickly realize that the taste is far from something you find fulfilling and yummy. Maybe you find it too bitter or too rough to chew. If something doesn’t taste good to you, your taste buds are letting you know it’s okay to skip it — and to find biological, psychological, and sociocultural value in something else. That’s okay. Make sure you know what you’re doing with the food — or at least have the fortitude to admit you don’t know what you’re doing so you can seek advice from someone who does (like Julia Child). Which brings me back to the case with kale. The above story is a personal one. The first time I tried it, I thought I hated it because I had no idea how to work with it. You don’t just use kale in place of romaine (unless you actually do and you like it). So, try to understand the food you’re working with and then prepare it in a way that tastes enjoyable to you. Nowadays, I don’t just chop up kale and throw it in a bowl; I massage it first with some olive oil, lemon, and sea salt since this makes it delicious! I could list off a whole lot of examples here, but dairy comes to mind instantly on this one. Not to demonize dairy in any way — since it’s a perfectly fine food for lots of people. But there are some who just can’t handle it! A dead giveaway for knowing that you have an allergy or an intolerance is how you feel afterward. If you can see a clear connection between consuming a particular food and how it makes you feel afterward — and that feeling is not a good one –this food might not fit for you. 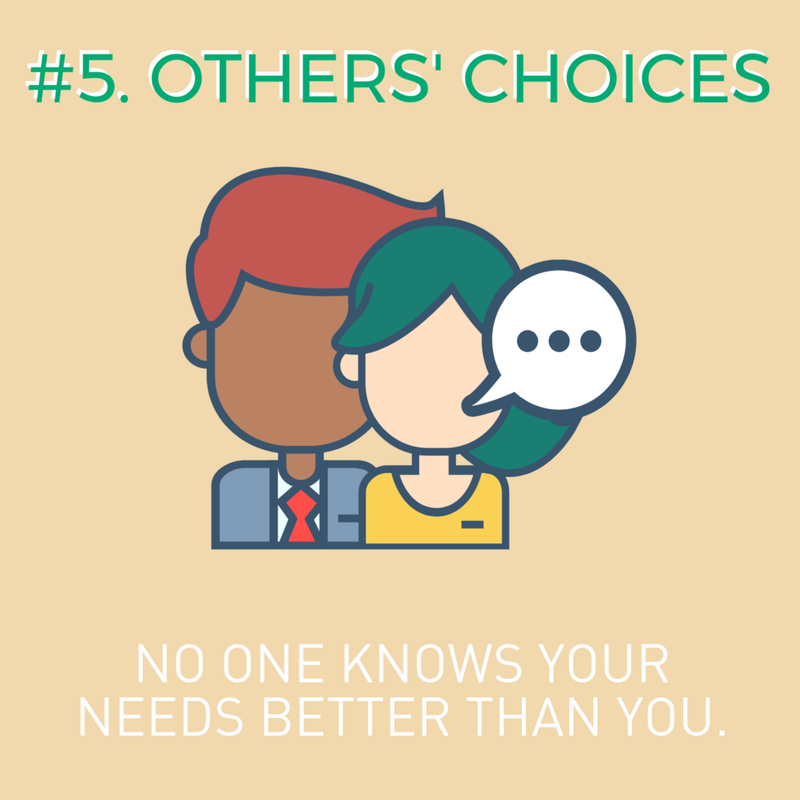 Regardless of how good it might work for others, it might not be right for you — and that’s okay. Because there isn’t one singular food that contains essential ingredients you can’t find elsewhere. So, if you’re allergic to seafood, for instance, there are other sources of omega 3 fats. Just like if you are intolerant to dairy, there are other sources of calcium. The one exception to this rule is when you make an exception to this rule. In other words, you might know full well that you don’t tolerate dairy, but you decide to grab an ice cream anyway. You did a thorough risk versus benefit analysis (by taking a mindful approach) and you chose to eat it. You made the call. 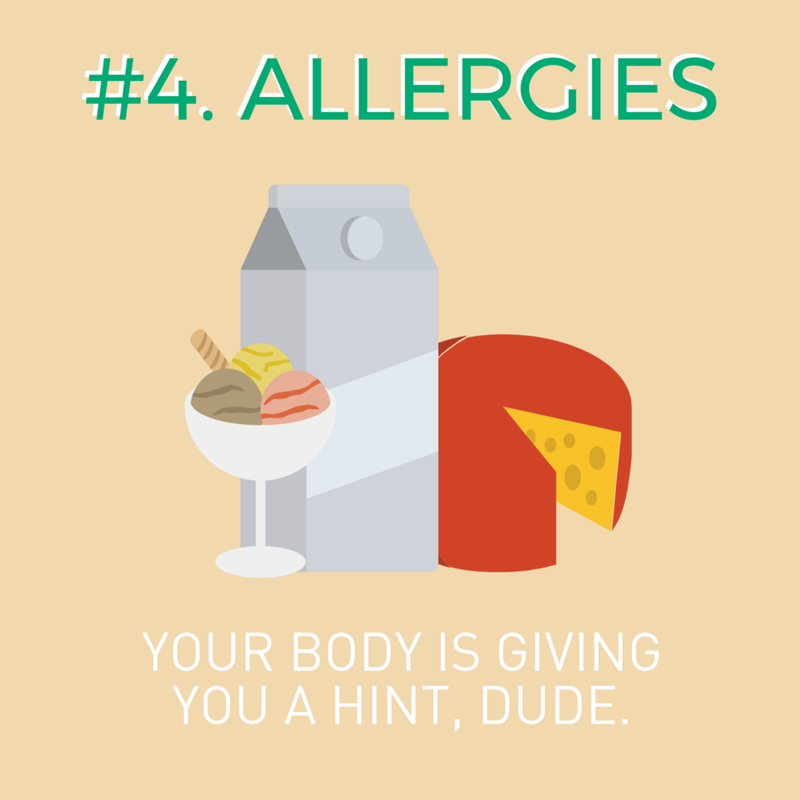 Not sure if the reaction you’re having to something is an allergy? You can always talk to your healthcare practitioner or a medical specialist (like an allergist or a dietitian) about your experience. One of the scenarios I use is this: You go out to eat at a restaurant that makes your favorite cheesecake. You had a late lunch, so you aren’t very hungry. You really only want the cheesecake, but instead, you order a healthy entrée first — grilled salmon with a sweet potato and sautéed veggies — and then you order the cheesecake for dessert. You leave the restaurant uncomfortably stuffed. Think about it: What happened here? What led us to feel uncomfortably full? What did we get stuffed on? We often lump foods into two categories: the good ones and the bad ones. And as we do this, we believe that if we don’t eat enough of the foods on the good list, we aren’t being morally good. As such, in order to “deserve” the cheesecake, we first eat the food we think we’re “supposed” to. But what would have been the true best choice in this scenario? To follow our body’s craving — and just go ahead and order the cheesecake. The exception to this rule is if your body is telling you to eat something. That’s right — the only person whose ideas about food you need to listen to are your own. When we reconnect with our bodies and rebuild our intuition around eating, our bodies will talk to us. They’ll tell us what we need. Practice listening. The idea that there are foods that we “shouldn’t” eat comes from the ridiculous idea that we can’t make choices for ourselves — that our bodies aren’t to be trusted, and so we need someone else to give us rules to live by. But when we repair our relationships with our bodies and follow their natural intuition, we can rely on our own senses to tell us what we want and don’t want. And that is a powerful reconnection! Now, hopefully from here on out, we can all chuckle at these advertisements. I know I will. And let us know the most ridiculous “Do Not Eat This Food” example you’ve ever heard in the comments. This is great. I don’t know how many of my clients have told me they don’t eat bananas because they will make them fat… Most likely from the very example you gave in this post. Thanks for your creativity and sense of humor! You got it Jenn, I mean give it a rub down. Kale is pretty coarse and when we massage it with the gain of the salt, the oil and the acids from the citrus it softens it up. Makes it more palatable. Try it!. Do you then cook it, or eat it raw (post-massage)? It sounds delicious, either way! You eat it raw. Search for massaged kale salad recipes online and try one that sounds good to you. I LOVE this list. The only thing I would add is the polite factor. 1, 2, 4 and a little bit of 3 come into play. Example: my then 4 year old daughter and I went to a birthday dinner at my sister in law’s. Her mother cooked dinner and it was… less than stellar. It included fish, which neither of us care for, overcooked veggies and sad potatoes. But since s-i-l was into odd foods, we had discussed the potential ick factor beforehand; unless it was 1, 2, 4 or 3 to the extent that you *knew you’d yak your socks, you eat it and be polite. love this article so much! hubby and i have tried brussel sprouts sooo many different ways and neither of us like them. so we just aren’t buying/trying to eat them anymore. June, thank you! I’ve been trying to respond to the five foods for a while. I could not have responded half as well! LOVE your post! I am an MS RDN, teach college level nutrition, have a small private practice wellness business and run a group ex program and I am sharing this with everyone I know, with a laughing emoji. Right? You are speaking my language….humor and good sense all in one. Thanks for posting this. I like to say, “Ewww, I hate that…here, let me try a bite.” I have to make sure I still don’t like it. I have found out that I do like foods I swore I never would, like beets. That is my new favorite thing to say today! You hit the nail on the head ! Love this list! I have only (just recently-at age 43) figured most of this out. If it doesn’t taste good- DON’T FINISH IT. I have a 9 year old daughter that I hope to read this to in the morning… Thanks for the (obvious & awesome) article! Awesome post! Thank you so much for writing this! I agree completely with your initial thoughts and appreciate your fun and thoughtful comeback. Finally a never eat list that makes sense! Thank you! An enjoyable article……made me smile! Fantastic article! Couldn’t agree more. Just jealous I didn’t write it myself first. 🙂 Thanks for sharing! do not eat as they will make you fat! They show a banana andthen they go off and want your information and try to sell stuff! love this post! The list is great. No food should be “off limits” unless is rotten, etc. I was smiling the entire time I was reading this. I was horrified when I saw the title, because it was so un-Green Mountain. But oh, the relief and delight of reading the eminently sensible and funny text. Makes me wish I wasn’t on the other side of the world and could come back to the wonderful surroundings and people there. I love this! This is a list that I actually agree with. I see many people who are afraid to eat foods, (really nutrient dense foods) because they have seen that food on a list proclaiming it is a bad food. Thanks for your list! This is worth publishing in whatever it is that people today read the most. SKIMM? Love it! So will my friends and relatives. Thank you, June! Excellent advice, and funny. I admit that I do not eat bananas because the taste and smell bother me. I can get potassium from other sources. Trying a food 3 times is great, google recipes for the food or add new vegetables to a stir fry. You got me. I couldn’t believe that my Green Mountain was putting out a list of things you can’t eat. It was especially good because one of my good friends has just given up meat — not because she doesn’t like meat, But she has decided its not good for her. I hope it works out for her. By the way, the corned beef and cabbage I had for St. Paddy’s Day was wonderful. I only have it once a year and its such a fun meal. Thanks for the laugh. I needed a June laugh today. I must admit I was a little surprised to see the title of your post, which of course is why I just had to read it. Anytime Mary. Thanks for reading and nice to hear from you. This is the best list!! Thank you! This article is what is “right” about the approach at Green Mountain. Get rid of the extremes and the rhetoric. Don’t forget, you shed your taste buds every 7 years, so don’t be afraid to try something you used to think you didn’t like because now you just might love it! Love the freedom of eating this way! I know in the past, those types of ads would try and draw me in, now I just keep scrolling!! June, my hat (OK, cap) is off to you. Magnificant piece of writing! The only ads I hate more are the ones that promise to “flatten your belly”–you know, the kind promoted by Dr Oz and his investors! I plan to try your kale preparation hint, and share your post immediately! Exceptions include the core of sweetcorn if it’s served as baby corn and soft shell crabs.